The Everett Alan Group provides a full suite of complementary services specifically aimed at homeowners, small businesses, land owners and the real estate community. Having multiple services under one roof can greatly simplify an already complicated process while at the same time reducing costs and decreasing the overall timeline from start to finish. Quality and customer service are always at the forefront of every project. Our goal is to make sure that your project is completed on time, on budget and with a level of professionalism that we feel is unmatched in the industry. Owner and Registered Land Surveyor, Jim Loftis, is personally involved in every project to ensure the same level of quality and customer service is maintained for every project. With over 30 years of industry experience in Arizona he is uniquely qualified for the task. If you are thinking about an addition to an existing structure , or building a completely new structure, make sure your first call is to The Everett Alan Group. Without proper planning and accurate information in regards to boundary lines, topographic details and city or country restrictions, costly mistakes can be made that may not be discovered for years down the road. We can assist in all stages of planning for any type of structural additions. We can provide the appropriate survey to determine boundary lines, setbacks and easements. 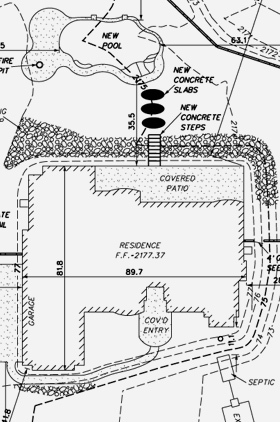 In addition to the initial survey we can also provide engineered site plans, and assist in the permitting process. Once the project is complete we can also perform an As-Built Survey to ensure the project was completed per the site plan specs to make sure that no problems arise down the road. We have been assisting homeowners and land owners with permit violations throughout Maricopa County including Rio Verde, Cave Creek, Carefree, Scottsdale and Phoenix. We will evaluate the situation and the validity of the violation, make recommendations for corrective action and help you get a proper permit in place. A Flood Elevation Certificate is a document generated by an engineer, surveyor, or qualified person that will provide data to help properly rate properties for flood insurance. An Elevation Certificate can determine where precisely your home is located in relationship to the Base Flood Elevation. You may want to obtain a flood certificate if your property is in a FEMA flood zone, and you are considering modifying it.